Bathroom spaces tend to look worn and old much faster than other rooms in the house. This is because the area is subjected to a lot of steam and water and it results in mold and mildew growth. Over time, the fixtures get worn out and start looking drab due to everyday use. This is why a bathroom renovation is something you should consider when you are upgrading other areas of your home. 314 Design Studio provides excellent Bathroom Design services to customers across Annapolis, Severna Park, Stevensville and. They also cater to customers in and around Arnold, Chester, Cape St Claire and Kent Island. Over the years, they have handled a number of projects for customers in Centreville, Riva, Easton, Chestertown and Mayo. Floor Plans - Planning of the bathroom spaces is as important as the rest of the rooms in your house. Just as it’s important to have all the right installations in the bathroom, it’s also important to ensure there’s sufficient space to move around comfortably. Many people want their bathroom to be a very comfortable area where they can start their day as well as unwind at the end of a busy day. This is why modern day bathroom contractors focus on creating spacious and comfortable bathroom zones. Lighting and Ventilation - These two factors are more important than most people think. A well-lit bathroom helps create a very fresh look in the space. They will also install dimmers and recessed lighting so you can create the kind of mood you want in your bathroom. 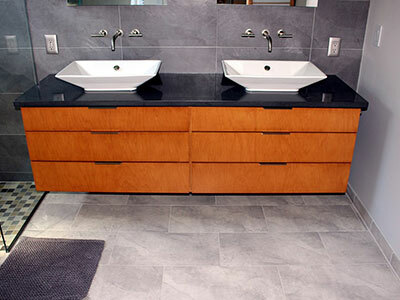 Floor and Wall Tiling - most bathrooms have tiled floors and walls. This is a very hardy and low-maintenance material that’s ideal for areas that see a lot of water and steam. The bathroom planners will help you with all the information you need about the different types of tiling available and will show you different samples and designs. This helps you make the right choice of tiling. Storage - Most homeowners want a certain amount of storage space in their bathrooms. Skilled and experienced designers will survey the space and provide smart storage solutions. They will take care to see that the designs they provide make optimal use of the available space. Aside from this, they will also make sure that water-resistant materials and finishes are used in the work. This helps ensure the longevity of the installations in the bathroom. The bathroom renovation specialists will handle all the project management and supervision when the work is in progress. They will also take care to see that the site is left clean at the end of every work day and that the work is completed on time. When you want kitchen spaces that will complement the look of the rest of your home, it’s best to hire experts like the ones at 314 Design Studio. They will provide you customized solutions at Bathroom Installation cost that fits perfectly into your budget.